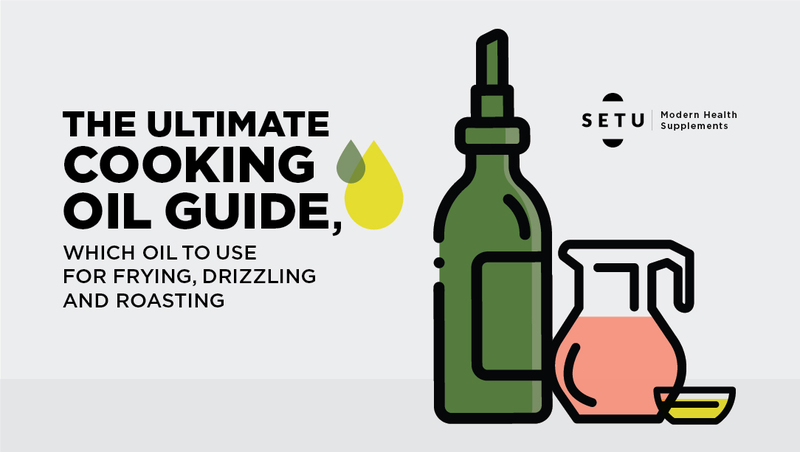 The ultimate cooking oil guide - which oil to use for frying, drizzling and roasting. If you have stepped into a supermarket recently, in all likelihood you would have noticed that cooking oils are having a major culinary moment. When presented with numerous varieties, it can be hard to determine which one is good for you and which one isn’t. First, let’s understand the different types of fats present in different oils. Saturated Fatty Acids (SFA) are a type of fats in which the carbon chains have predominantly single bonds that are filled with hydrogen atoms3, and this makes it resistant to oxidation. That’s why oils with a high SFA content are good for deep frying. Monounsaturated Fatty Acids (MUFA) are fatty acids that have one double bond of fatty acids, while the remainder of the carbon chains are single bonds. MUFAs are proven to reduce cholesterol levels, which in turn reduce the risk of heart diseases. In MUFAs, the hydrogen atoms aren’t as densely packed as in SFAs, hence they have a lower smoke point. 4Having said that cooking oils with a high percentage of MUFAs are recommended for their nutritious values. Polyunsaturated Fatty Acids (PUFAs) miss many hydrogen atoms and have two or more bonds of fatty acids. PUFAs can aid in reducing bad cholesterol, which in turn lowers the risk of heart diseases.5 Cooking oils rich in PUFAs provide essential fats like Omega-6 and Omega-3 that our bodies cannot produce by themselves. In recent years, the concept of an ideal ratio of Omega-6 to Omega-3 fatty acids in the diet was developed due to data that shows that the intake of Omega-6 has increased while Omega-3s has decreased. 6This posed a problem because while Omega-6 are pro-inflammatory, Omega-3 is anti-inflammatory. Scientists have proven that diets that are balanced in Omega-6 and Omega-3 (1:1) reduce inflammation.7 Research has suggested that inflammation contributes to multiple health risks including cancer, cardiovascular diseases, mental wellness and arthritis. PUFAs should be used in smaller quantities due to the free radicals that are produced during cooking. In essence, monounsaturated fats and polyunsaturated fats should be the highest, while trans fats and saturated fats should be avoided as much as possible. Unrefined oils are filtered very lightly, mainly to get rid of large particles. Unrefined oils are more pronounced in flavours, colours and fragrance and may appear cloudy. Studies have shown that unrefined oils have higher nutrient values, but a shorter shelf life and are usually refrigerated.12 When exposed to high temperatures, they produce a rancid smell. Desi Ghee (Clarified Butter): If you live in India, you may know the importance of ghee in our everyday lives. This product is basically free of the milk solids, which are found in butter and therefore, has a higher smoke point. Research indicates that consuming a spoonful of ghee in our foods also keeps inflammation at bay. A study published by the Indian Journal of Medical Research suggests that when ghee protects the body from carcinogens in the liver.14 While ghee contains a significant amount of saturated fats (65%), it has a high level of MUFAs, which is something our body requires. Ghee can be used for crisp sautéing or spread lightly on Indian bread and cooked rice. Ghee can withstand high temperature and is great for cooking Indian curries. Avocado Oil: Avocado Oil is super rich in monounsaturated fats (70%) and it has one of the highest levels of monounsaturated fats amongst other cooking oils. Similar to olive oil, it is low in polyunsaturated fats (20%), which means that it has a high level of healthy fats.15 Avocado oil is great for drizzling on top of salads or dips, and due to its ability to withstand high temperatures, it can withstand light sautéing, grilling and roasting. Canola Oil: It has the least saturated fat content among all cooking oils. There are many studies that prove that canola oil that hasn’t been refined extensively can reduce the risk of heart diseases and strokes. It is rich in MUFAs (62%) and can be used in a variety of ways, whether that’s baking, stir-frying, deep frying or sautéing. The best kind of canola oil is one that’s free of GMOs.16 It contains a high amount of Omega-3 than most vegetable oils and can reduce inflammatory illnesses like cancer and cardiovascular diseases. Extra Virgin Olive Oil (EVOO): Widely popular in the Mediterranean diet, olive oil is the most common type of oil used in cooking. Extra Virgin Olive Oil comes from the first pressing of olives, which results in an oil that is strong in flavour and has a fruity aroma. EVOO is less processed and usually unrefined, which means that it has been extracted the same way an olive tree would naturally extract oil from its seed. It is typically more expensive than other oils and is rich in antioxidants.21 Olive oils have the highest content of MUFAs (77%) and are rich in antioxidants called polyphenols, which scientists have linked to heart health.22 It’s a good option for sautéing vegetables, light pasta, dipping bread and margination of meats and vegetables. While there are many options available, I tried to keep the list of oils as quaint as possible. Primarily because living in India, these are the most accessible oils available at a decent price. One should not have to climb mountains and move seas to find the “perfect” cooking oil. In any case, here is a table of oils with similar heart benefits that can be used in various methods. Dips and Dressings: EVOO, Avocado Oil and Sesame oil Flavoring:Flaxseed oils and Sesame oils. Oils which are heat resistant are perfect for this as they won’t make your food oily. With many cooking oils to choose from, there are only a few that you should aim to grab. Cooking oils come in different colors, flavors and sizes, and just like we are prone to checking the nutritional contents of any packaged item – we should consider reading the fat contents of oils too. Lastly, products which are the most organic and unrefined are the best. • When buying cooking oils, always turn to the back and check the fatty acid contents. • Monounsaturated and Polyunsaturated content should be higher than saturated fatty acids. • Always opt for an organic and unrefined version of any cooking oil. • When cooking, one should consider what they are planning to prepare and the smoke points of each oils. • While the healthy fats of each oil are listed, it is not meant to be consumed like we consume calories. First rule of eating: “Everything in Moderation”. • Always say no to trans-fat. • Always opt for glass packaging over plastic and tin bottles.